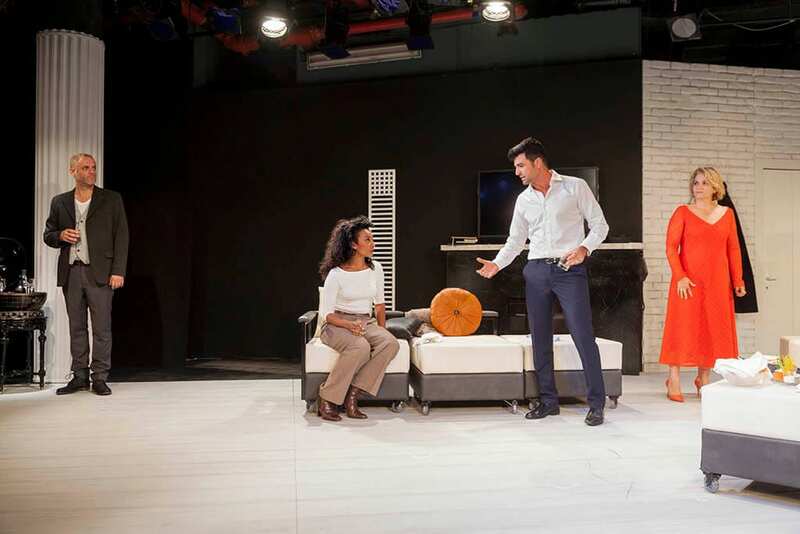 The Cameri’s production of “Disgraced” by Pulitzer Prize winning playwright Ayad Akhtar, had its opening performance at the Cameri Theatre, Thursday night in Tel Aviv. 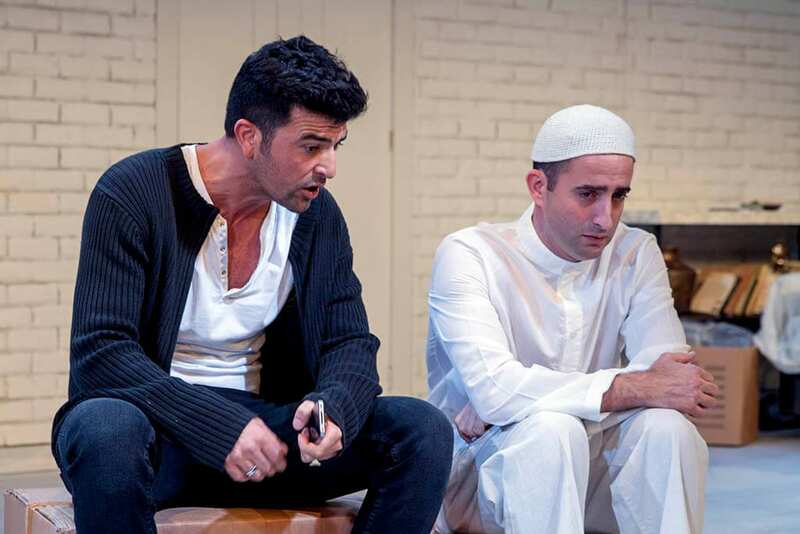 The play tells the story of a young Muslim American man trying to assimilate into New York City in the shadow of the events of 9/11 and the resulting rise in racial tension in America. Amir Kapoor (played by Amos Tamam), born and raised a Muslim, is married to the WASP (white Anglo-Saxon Protestant) Emily (Sara Von Schwarze), an up and coming artist who is deeply influenced by Muslim designs and early Islamic art. Amir’s nephew Abe (Eran Mor), is also struggling with his Muslim and secular identity. We are also introduced to Isaac (Micha Selektar), a Jewish art dealer, and his wife Jory (Ruth Asrsai), a hard-working lawyer at the same firm as Amir’s, and who is of African American descent. Amir’s resentment towards Islam led to his changing his name and identity, marrying a white Christian woman, working for a Jewish law firm, and doing all he can to make it clear that he despises the religion into which he was born and raised. Amos Tamam delivers a strong performance, taking us deep into his thoughts and feelings in a courageous attempt to allow strangers to hear the inner musings of a Muslim among Christians and Jews. He is the star of the show, but others give shining performances as well. The viewer must listen closely to the dialogue and also pay attention to all the small body gestures in order to stay on top of the action. The conversations consist of a lot of “name-dropping,” from Aristotle to Jerry Saltz (a well known New York art critic), and from Henri Mattise to the Hindu god Shiva. The playbill (and I cannot urge theatergoers enough to get one), does a great job helping out with this, offering explanations of almost every cultural reference in the play, while also including interesting articles about the playwright, Islam, September 11th, Muslim immigration, and more. The play clocks in at about ninety minutes, but the quick pace of the dialogue makes it seem like much less. 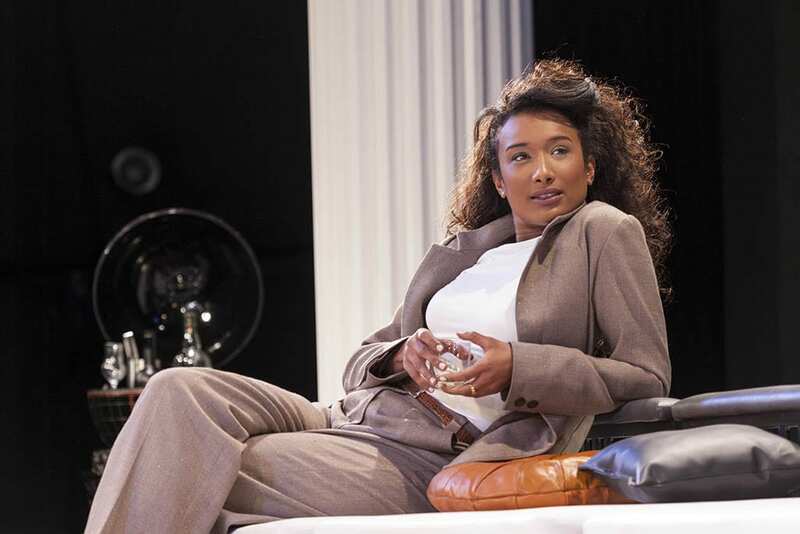 The dinner party scene, which takes up the better half of the play, includes conversations ranging from jokes to philosophical debates to violent outbursts. The cast handles this range of dialogue and emotional pitch in a natural, almost effortless manner. 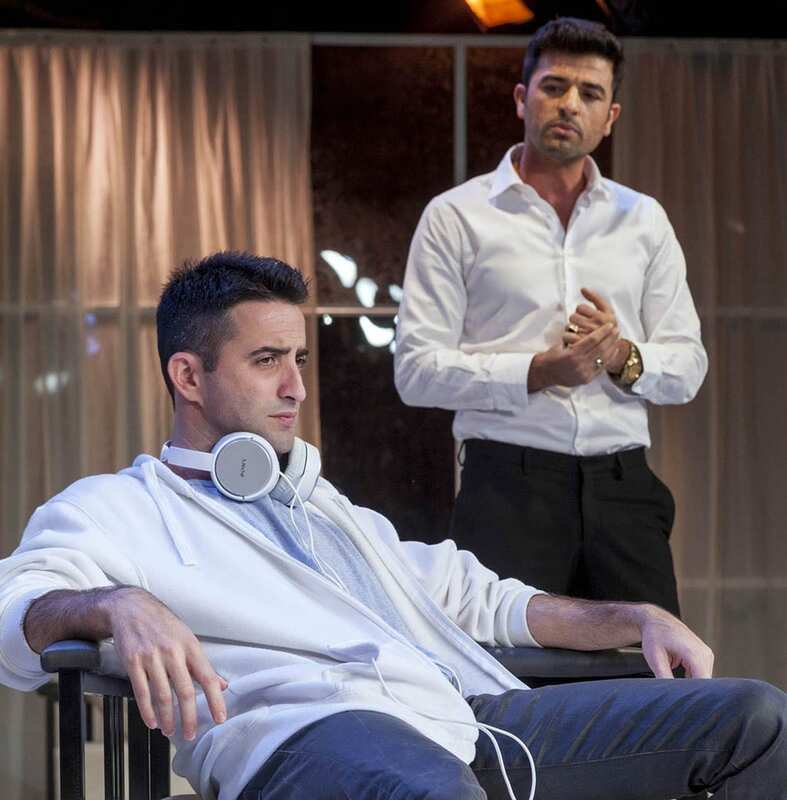 Director Kfir Azulay deserves recognition for making a very “American” play into something that feels accessible to a mostly Jewish, Israeli audience. 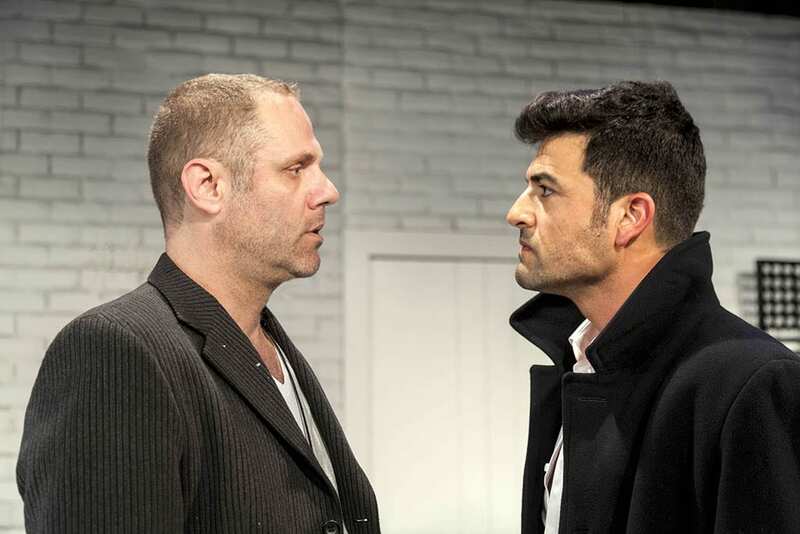 No easy feat, the result feels as though he took advantage of the difference between the American and Israeli audiences and sharpened the relevant themes even more. In my opinion, the play faithfully recreates the awkward, yet familiar social situation of a dinner conversation about taboo subjects such as religion, race, and assimilation with persons who are at the same time very different from our own selves, but also very alike. It is no coincidence that every character represents a minority and the mindset that goes along with it. The audience cannot help but become more self-reflective and socially aware as the rollercoaster of emotions plays out on stage. “כבוד אבוד” מאת איאד אקטאר מתאר את סיפורו של אמיר, עורך דין צעיר ושאפתן המפלס את דרכו בעולם חשדן וטעון, לאחר נפילת מגדלי התאומים. סיפורו חושף סביבה הפכפכה, הנאבקת בין זהויות גלויות ונסתרות, ובין אמונות ליברליות לפחדים קדמוניים. קצבה המהיר של ההצגה מכניס את הצופה לתוך ממד של הגיגים פילוסופים מחד ומחלוקות אקטואליות מאידך. הצופה נשאב אל תוך נושאים הנחשבים טאבו בחברה המערבית; דת, גזענות, וטשטוש זהות. שאלות רבות אשר עולות מהתנגשות הציוויליזציות המתרחשת כל העת בין מזרח למערב, מקבלות נופך אנושי ומספקות תשובות מרתקות. Born and raised in Jerusalem Hillel is now studying Literature and Jewish History at the Hebrew University, Jerusalem. He enjoys journalism, reading fiction, politics and current affairs.